Jean-Jacques Tuffery is the third generation of his family of master tailors-clothiers. Here we present a portrait of a man with hundreds of thousands of Made in France jeans behind him. To launch this section devoted to news and features, we wanted to introduce you to one of the most emblematic figures in Made in France jeans, Jean-Jacques Tuffery, third generation of a company stretching back more than 125 years. 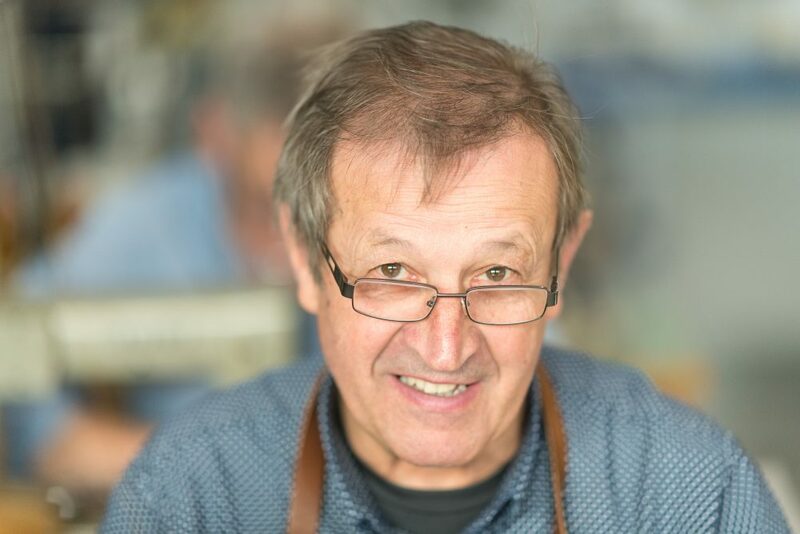 Jean-Jacques Tuffery was born in 1948 in the heart of the Cévennes and learned the incredible profession of tailoring jeans from the age of 15 with his father, Alphonse Tuffery. After 55 years of creating jeans, the man also known by his nickname J.J. has hundreds of thousands of Made in France jeans behind him and has become one of France’s leading denim experts, possessing all the most important secrets of his art. After observing someone for just a few minutes, he is capable of creating tailor-made jeans from A to Z and today not only hands on his know-how, but also turns ideas into reality…So, we meet the workshop’s artist, Jean-Jacques Tuffery, through a questionnaire inspired by Proust but Tuffery style! WHAT DO YOU LIKE BEST ABOUT CÉVENOL PEOPLE? Their welcoming and jovial side. They are hard workers and, above all, care about the quality of their family life. WHICH PART OF THE JEANS IS YOUR FAVOURITE TO WORK ON? Work on the back pocket! It’s meticulous, super important because it embellishes the buttocks and, furthermore, it’s the whole identity of TUFFERY. WHICH LINE IN THE COLLECTION IS YOUR FAVOURITE? Celestin of course! They are jeans that I’ve been working with for 55 years. It’s a line that has gone through all the different fashions and we have barely adapted it over time. And at the time when there was only one pair of jeans that was still made in France, it was Celestin! Creating the new lines. Reflecting on what’s new and imagining the product that will perfectly match what our customers want. Whether that is in terms of cuts, finish or raw materials. I love the creation of these products, which are very sober visually, but right up to speed in terms of technique. WHAT’S MOST IMPORTANT FOR A MASTER TAILOR? A job well done. We have to respect the smallest details, at all stages, because the final result – elegance and resistance – depends on it. YOUR HEROES IN THE TUFFERY FAMILY? My father, and my mother who was the perfect accomplice! In the 50s, he invested everything he had to set up his large workshop in Florac. It is thanks to him that the workshop took on another dimension, meeting the needs of the ready-to-wear market of the time. YOUR FAVOURITE PART OF THE WORKSHOP? The cutting room. Very spacious, open, nice to be in with hundreds of references for denim clothing surrounding me. It’s in this room that the magic gets to work, since these “vulgar rolls of fabric” begin to come alive, to gain in volume. A good cut is the secret of perfect denim. YOUR FAVOURITE MOMENT OF THE DAY AT THE WORKSHOP? When I arrive in the morning! I know that I am going to spend a rewarding, fascinating day, which always passes very (too) fast. THE MOST INCREDIBLE REQUEST ATELIER TUFFERY HAS HAD? A denim cauldron some 100 metres in circumference for a festival that was taking place in Florac. It was a bit of a crazy request, but inside this cauldron was the dance floor!